On Boxing Day 2015 the hamlet of Oldroyd (OS 3949 4241) which comprises a street of former mill or farm workers cottages dating from the 19th century, was partly inundated by flood water running off adjacent sloping fields, a total of five properties were affected, similar problems occurred during the summer floods of 2012. The residents were keen to install large diameter pipes across fields to collect the excess water and discharge it downstream away from their properties as quickly as possible. However, such a scheme would prove to be outside of the budget of £25,000 for the works as the cost of the pipes alone exceeded this figure. The project was funded by the Repair and Renew Grant Scheme run by Calderdale MBC following the Boxing Day floods, this was a central government grant made available to homeowners and businesses whose properties were flooded or very narrowly avoided being flooded. 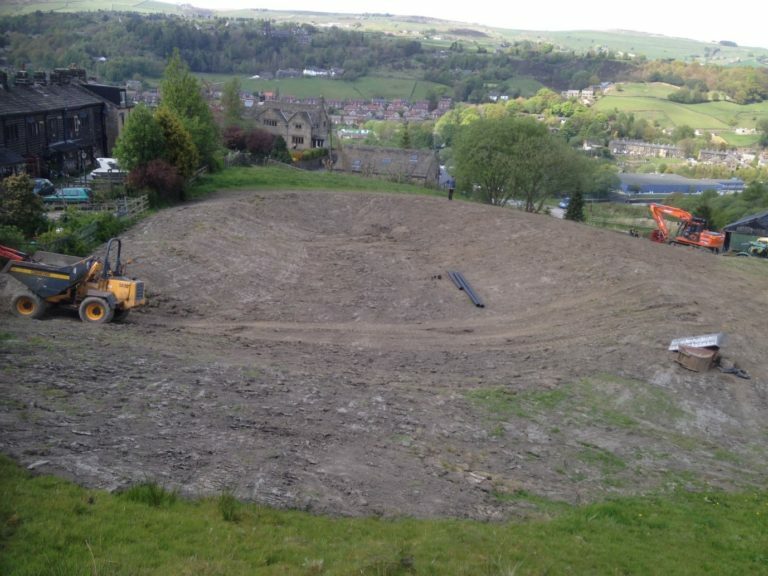 A much more cost effective scheme was put forward by Slow the Flow Calderdale civil and structural engineer Stuart Bradshaw which required the excavation of an attenuation pond to temporarily store water, and then slowly release it once the storm had passed. This would solve the flooding issue for the residents of Oldroyd yet at the same time it would slow the flow of water to the River Calder with consequential benefits for the downstream communities of Hebden Bridge, Mytholmroyd, Luddenden Foot, Sowerby Bridge and Elland all badly affected by flooding on Boxing Day 2015. Neighbouring farmers who owned the land that would be used for the works were assured that their fields would be returned to pasture once the works were completed. 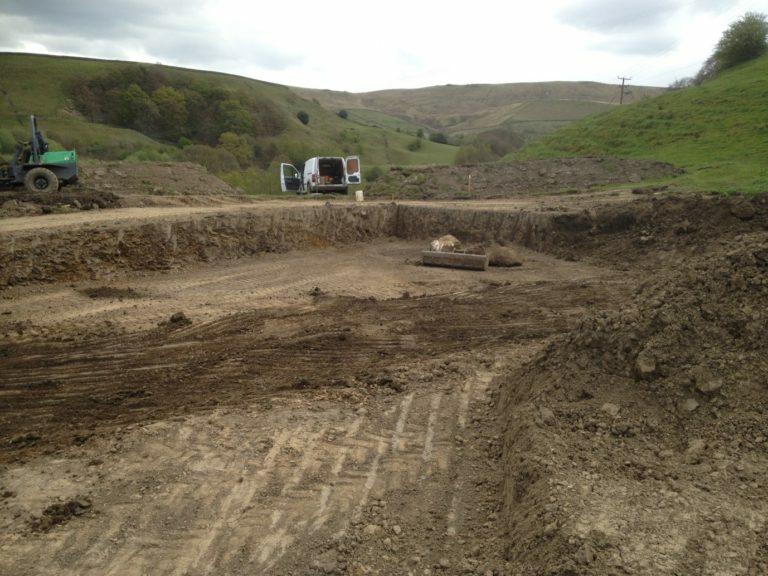 The scheme comprises an interception channel which is simply a trapezoidal cross sectional channel dug across the bottom of the hillside above the properties, this diverts the water away from the properties to flow into an attenuation pond with an approximate volume of 800 m3. The attenuation pond has a 150 mm diameter outlet pipe which allows water to flow out of the pond at a rate of around 25 l/s leaving excess water to rise and be stored temporarily in the pond. The maximum depth of the water is less than 1.0 metre and due to the fall in the land most of this water is stored below the former existing ground levels by digging into the hillside and using this soil to create a low embankment on the lower side. The attenuation pond should provide protection for up to a 1 in 50 year storm, storms of a greater intensity will over top the pond but water then flows over a weir on the dam crest which directs the water away from properties and onwards downhill on a flow path that takes it away safely.